Our proprietary technology allows us to aim for specific sizes while maintaining excellent monodispersity in the amounts needed by our customers. 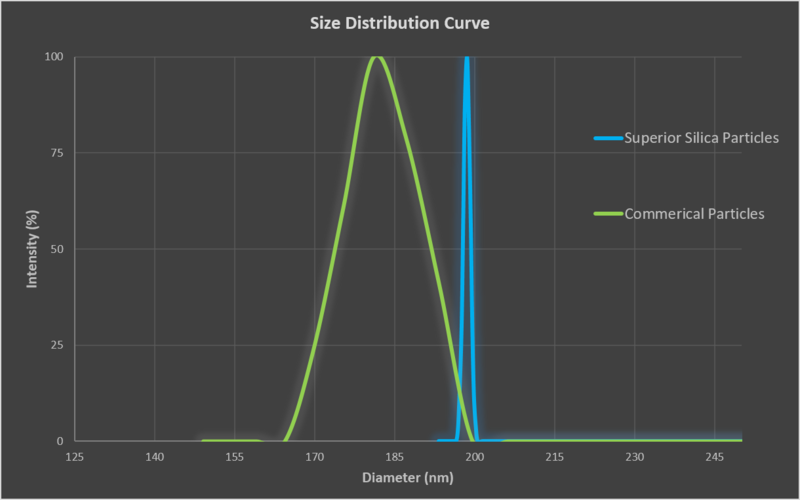 Our ability to target a specific size is demonstrated via the distribution curve shown above in blue. Our 200nm particles are measured at 199.2 nm with a polydispersity of 0.005 and a CV <2%, while commercial particles (green) show consistent variation with a much higher polydispersity of 0.083 and an average particle diameter that’s considerably lower than expected. The vast difference between the structural integrity of the particles is evident in this SEM image. The Superior Silica nanoparticles (left) preserve the round shape throughout the distribution of particles whereas the commercial particles (right) show unevenness in both size and form. If you are interested in what we have to offer and would like to take an in depth look into our products, please click below.